J. Evans Dairy a Grade II listed building on the corner of Warren Street and Conway Street. Built 1793 and tiles circ. 1916 a rare surviving example of a Welsh dairy. IT IS A CUT THROUGH we cabbies once used when wishing to turn into Euston Road from Tottenham Court Road, by turning down Warren Street we once missed the traffic and join the bus lane at Great Portland Street which also had the added advantage if you timed it correctly of enabling you to collect your evening newspaper without the inconvenience of having to stop as the friendly vendor standing on the corner presses the paper into your hand. I have used this cut through numerous times and have always admired this little corner shop with its blue tiles hardly realising how important the shop was once. Unfortunately Camden council had now put pay to this useful detour. 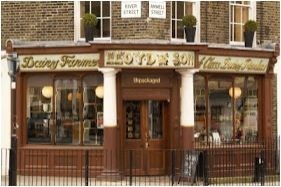 Before (and during) the time I was on the Knowledge I was the postman for Evans Dairy in Warren Street. It was always closed. I was on that walk for a couple of years and I think I saw it open only twice. Both times the sisters were there, both of them of the Evans clan. They were very aged, this would have been about 1985, but the thing I remember distinctly was the shop – it was a time warp inside. They must have had modern groceries for sale but it really was like stepping back in time on those all too rare occasions. it is still featured on the sidebar, the delay is due to Christmas and other commitments/distractions I’m still reading it, I’ll write a post when it’s finished. This article reveals that devastating economic times caused such an exodus from Wales. We had a Welsh dairy around the corner in Talbot Rd. And have just finished reading the bit in Norman Balon’s 1991 memoirs about the Express Welsh dairy in Frith Street. Which would see the Pughes family deliver milk to any of the surrounding neighbouring business’s night or day, including his Coach and Horses pub. The Pughes father was an elder in the Welsh Chapel in Charing Cross Road, and Balon remarks what a fantastic place their Welsh farmhouse kitchen in the basement was. Was puzzled reading about the Presbyterian Chapel in CC Rd, now I understand *why* there was a big enough congregation. There must have been a huge exodus from Wales in the 19th century if the number of comments I receive when writing about Welsh dairies are anything to go by. I think I get more comments on this than any other post. Thanks for your comment.